All BioBricks of the iGEM Team Bielefeld were screened to identify the best conditions for protein expression. The first trials were made by shaking flask cultivations with different parameters. These parameters were various shaking flask designs, different temperatures, different concentrations of chloramphenicol, various induction strategies, several cultivation times and some cultivations in absence or presence of CuCl2. To detect the produced laccases, different analysis methods were performed like SDS-PAGE analysis as well as MALDI-TOF. The iGEM Team successfully produced four active bacterial laccases and succeeded to purify four of them. Besides the successfully scale-up fermentation, these laccases could be purified in a high amount to characterize the optimal activity conditions regarding pH, temperature, buffer solutions and organic solvent resistance. 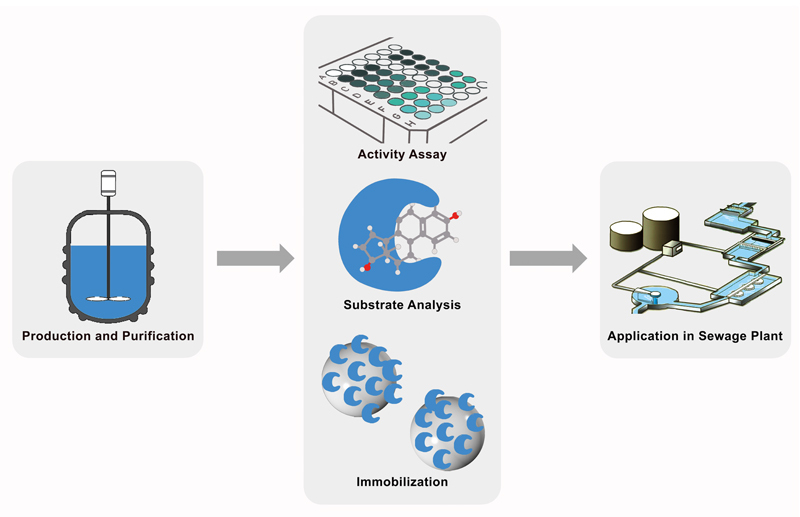 Furthermore, the iGEM Team Bielefeld demonstrated that the produced laccases can be immobilized maintaining their activity and the degradation capacity was screened for several micro-contaminants. These tests indicate that all of our produced laccases are able to degrade estradiol and the two laccases TTHL and BPUL are able to degrade ethinyl-estradiol in combination with a mediator. 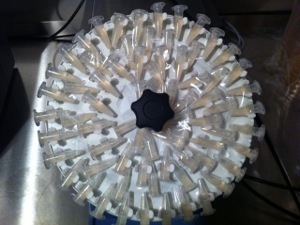 At this moment, the self-designed shuttle-vector for the production of eukaryotic laccases in yeast is ready to go. This vector was tested to integrate by courtesy of homologous recombination genes of eukaryotic laccases into Pichia Pastoris and produce them in an active form. First experiments show a successful production of one laccase of Trametes versicolor. A cheap alternative purification and immobilization method via a cellulose binding tag is also close at hand. During our research, we cultivated the following BioBricks and produced several laccase. To simplify the presentation of our results we named the produced laccase like the corresponding system. iGEM Team Bielefeld is developing a biological filter using immobilized laccases, enzymes able to radicalize and break down a broad range of aromatic substances. For the production of laccases from different bacteria, fungi and plants, two expression systems are used: Escherichia coli and the yeast Pichia pastoris. Immobilization is carried out either by using CPC-silica beads or by fusing the enzymes to cellulose binding domains. The concept could be extended to other toxic pollutants in drinking and wastewater, as well as to industrial applications in paper and textile industries or even for bioremediation of contaminated soil. All bacterial laccases (ECOL, BHAL, TTHL and BPUL) we accomplished to purify. Besides the successfully scale-up fermentation these laccases could be purified in a high amount to characterize the optimal activity conditions regarding pH, temperature, buffer solutions and organic solvent resistance. Furthermore the iGEM Team Bielefeld demonstrated that the produced laccases can be immobilized maintaining their activity and the degradation capacity was screened for several micro-contaminants. These tests indicate that they are able to degrade estradiol and ethinyl-estradiol. To establish the methods for degradation analysis of different substrates TVEL0 was used as positive control. 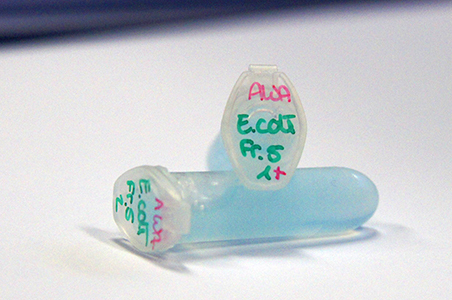 After that the four produced bacterial laccases were analyzed. The HPLC results showed that estradiol and ethinyl estradiol ( with addition of ABTS) are degradable with our laccases.To determine degradation products of estradiol and ethinyl estradiol after laccase treatment LCMS-MS analysis were done. For more informations click here. A cheap alternative purification method combined with a powerful immobilization tool could be the solution to prevail over other more expensive water cleaning methods like oxidization with ozone or using tons of activated carbon which just capture microcontaminates, but does not dismantle them. A promising solution to this could be cellulose binding domains (CBDs). Cellulose is ubiquitous and sustainable. Following this idea fusion-protein-constructs with cellulose binding domains have been made. To characterize a GFP has been introduced as a C or N-terminal domain of the cellulose binding protein. After delays in cloning the constructs for two fusion proteins with a T7-promoter could be finished, but did not express the protein in E. coli KRX and BL21. An alternative construct with a constitutive promoter could also be finished, but gave the same results. 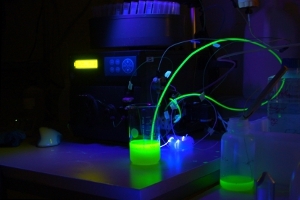 Changing the order of CBD and GFP was carried out, but was hampered by a base deletion in the GFP gene causing a frame shift and could not be redone in time. A shuttle vector for site-directed recombination into the yeast P. pastoris does not exist in the parts registry and could be developed by our team. With this system it is possible to recombine a protein of interest with a N-terminal mating factor alpha 1 for secretion the protein into the media. This protein of interest could be cloned in frame with one restriction ligate cloning step. The selection depends not on an antibiotic resistance like zeocine, but on a complementation of histidine auxotrophy. This system is for us important because some of our laccases can not be expressed in the prokaryotic expression system E. coli, because the protein needs glycosylation. Read more. The BioBrick BBa_K729006 from the University College London was characterized by us. Therefore E. coli KRX containing BBa_K729006 and E. coli KRX as a negative control were cultivated in shaking flasks and a growth kinetic was determined. The harvested cells were lysed via sonication and substances with a low molecular weight were seperated out of the supernatant. After purification the sample was analyzed by SDS-PAGE and MALDI-TOF. For a comparison E. coli KRX containing BBa_K7863005 was cultivated and analysed by SDS-PAGE as well as tested with a laccase activity assay. BBa_K729006 and BBa_K7863005 showed a similar behaviour in oxidizing ABTS. Read more. Fifteen students from different fields of study from the Bielefeld University aspired to complete a project called TOXIC COMPOUNDS IN NATURAL WATER - A CASE FOR LACCASE. In his Wiki we document our achievements and our approach.